How to get the app. Use our handy links to access our app on the Apple iTunes store and Google Play (for Android devices). Just follow the prompts to download, activate and enjoy. 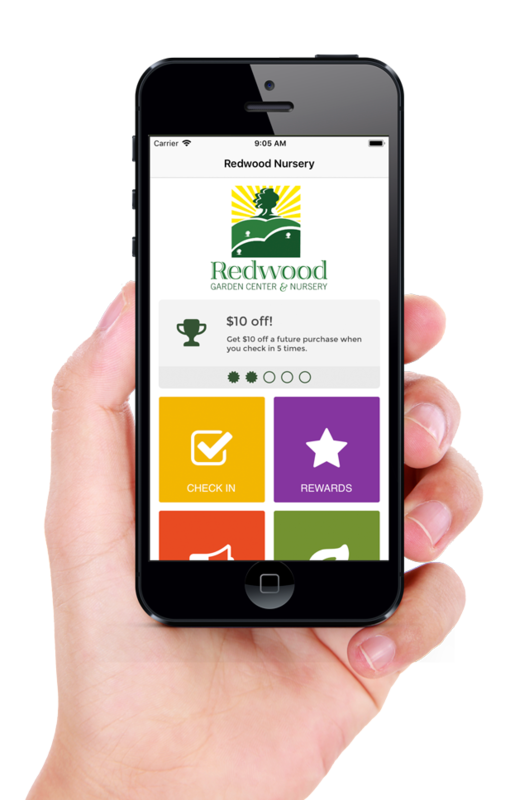 The Redwood Nursery app is designed to help you have more fun in the garden and at our garden center. Each time you visit the garden center your purchase will be validated at the register and you’ll receive another ‘punch’. After 5 punches you’ll earn a reward. Click on the rewards tile and you’ll see all the rewards you’ve earned and all those you are eligible for. A couple of pointers – you’ll need to have the app open in order to take advantage of some of the app’s features. Tips & Topics – We use our ‘Tips’ feed to access gardening news, interesting seasonal gardening articles, videos as well as upcoming events, sales or specials. Featured Products – You’ll notice several tiles with icons or logos of some of our featured products. Tap to learn more – these will link to videos, plant search tools and instant incentives.